We are incredibly grateful to the Toyboys, of the Rotary Club of Charles Sturt Grange, who this week donated almost 100 toys to our Christmas Appeal. The handmade wooden toys are a highlight each year for the children who receive them through our Emergency Relief centre. UnitingSA Minister Les Underwood attended a presentation ceremony at the Toyboys Woodville factory on 28 November, along with representatives from other charities. 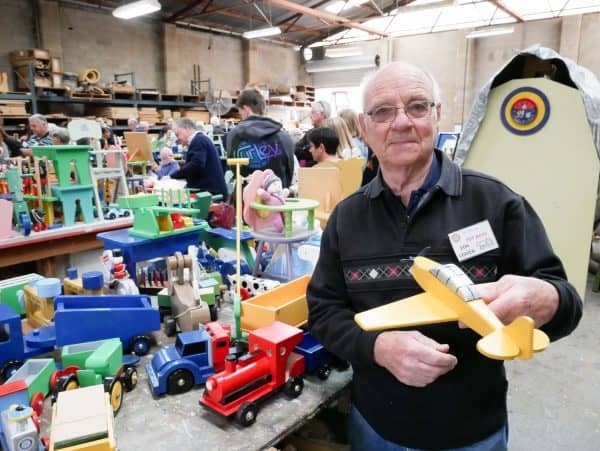 “We are so grateful, on behalf of those who receive the toys, for the generosity and the skill which you put into creating them,” Mr Underwood said. “We set up a large toy room at Christmas where we invite families in to choose the toys they would like to give their children. “These are always the first toys to go. Unfortunately, the Toyboys’ time at their Woodville factory has come to an end and they are desperately seeking a new home to continue their operations next year. Despite searching for several months, the volunteer group is yet to find a suitable premises to create their toys, but is determined not to give up. “In terms of our future, watch this space for what happens next,” president Peter Read says. If you or anyone you know can help find the Toyboys a new home, phone 8347 4987.